I didn’t read book #1 of this series. I saw the galley up but didn’t go for it for some reason. 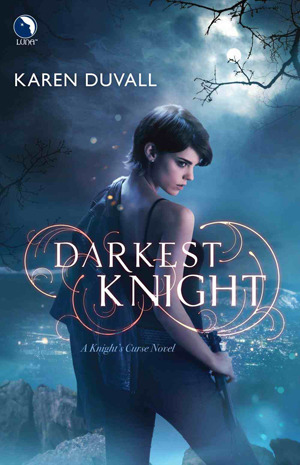 But then I read the magic word gargoyle in this blurb and I was all over it. I was in it for the gargoyles, you see? I’m a fan. The angels sort of jumped me between the pages. Sigh. I’m not big on angels in PNR, I’ve said that before. I’m sorry, I’m just not big on them. Unless they’re fallen, or more of a guide-like sort of appearances, angels and romance simply don’t mix well for me. So from a point on, I was actually sort of…uhm…not with the story. The characters were fun to read about, and I liked Chalice. Other characters I had a bit of trouble relating to, what with their angel involvement and everything, but Chalice I did relate to since she’s pretty much the rebel. The whole world of the book was interesting though it played a lot on themes I’m not a fan of, as I mentioned above. But the world built was really interesting, I liked the concept of it and it felt like it flew well. The plot was energetic and lively, with a pace of events I personally liked a lot. It read as an adult romance only in a couple places, not a lot adult there either. In fact it was pretty close to a YA, I could have easily seen this made a YA novel with minor adjustments and a curtain drawn in few places. This all made the read feel like something of a crossover from YA to adult, not really there, not quite here. This is a zone I feel very comfortable with, I love in-betweens. The writing was good, it kept me interested and engaged even though a lot of the plot played on a side of the field I have no interest in (angels), so that right there shows just how good the writing was. The PNR angle wasn’t played up a lot, it was that sort of romance on the go kind of thing, I find those really fun and entertaining. This was a really entertaining book. All in all I say you should definitely try reading it. I would even go as far as saying it’s safe to read for end-segment YA readers, since it has that flair to it. There’s a lot of cool plotting, new elements that were all the rage for me, and good entertaining writing. Give it a try.